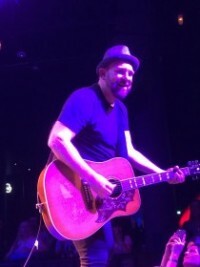 Kristian Bush last appeared at the O2 at the inaugural Country2Country festival back in 2013, for what was his very first performance as a solo artist. With Jennifer Nettles as platinum-selling duo ‘Sugarland’, Kristian had 5 number 1 hits, nearly a dozen top 10 hits and even won a Grammy. Since 2013, Kristian and Jennifer have embarked on their own journeys as solo artists, and the O2 was very much the beginning of Kristian’s solo career. On 14th November 2015, Kristian was invited back to perform at the Brooklyn Bowl, headlining the very first C2C Social event, designed to build momentum for the main festival in March. The event proved to be a massive success, as the near-capacity Brooklyn Bowl crowd enjoyed a wonderful night full of great country music. The first act on stage were Portsmouth-based band Hometown Show, who have played at the Country2Country festival for 2 years running. I had never seen them before, but it soon became very obvious as to why they have become a C2C favourite. They are the British equivalent of Old Crow Medicine Show, bringing so much energy to the stage and lighting a room up with their traditional country/bluegrass sound and impressive musical talent. Hometown Show were perfect for this event, epitomised when they got the whole Brooklyn Bowl crowd singing along to their cover of ‘Wagon Wheel’, which created a wonderful atmosphere and set the tone for the rest of the evening. They stopped to talk with fans after their show and sold out their CDs – it’s great to know the traditional country sound is still alive, and the crowd absolutely loved it. If you have the opportunity to go out and support these guys, don’t miss it. Soon after, Lucy May took to the stage with a full band. Lucy has had a fair amount of success, particularly with her single ‘Paper Heart’ which made the Radio 2 B-List back in 2013. I absolutely love this track’s catchy hook and lyrics, and Lucy performed it brilliantly at the Brooklyn Bowl. Despite not seeing Lucy live previously, I had seen clips of her performing acoustically, and I have to say the songs were totally brought to life here by the full band, who were superb from start to finish. A personal highlight in her set was her performance of ‘We Got It’, a really catchy track that fuses pop and country beautifully. Lucy filmed the video to this track in New York, and I would urge anyone to go and check it out. In between the acts, DJ Baylen Leonard provided us with some of our favourite country hits, including tracks from past and future C2C performers such as Lady Antebellum, Eric Church, Chris Stapleton and more. It really was a fantastic atmosphere in there; the floor was full of passionate country fans singing their hearts out…..and I dread to think how much money was made on the drinks! As Kristian Bush put it, let’s say it was a case of people being “over-served”! At 9:45, Kristian Bush took to the stage accompanied by his brother, Brandon, on keyboard. Despite the lack of a full band, Kristian totally made the stage his own, reeling off a string of Sugarland fan favourites such as ‘Stuck Like Glue’, ‘All I Wanna Do’ and ‘Baby Girl’, as well as many of the tracks featured on his debut solo album ‘Southern Gravity’. What struck me most about Kristian was his incredible charisma – he draws attention as soon as he walks on stage. He is a true showman, and the way he engages the audience really is a lesson in entertainment. The highlight of the show for me was Kristian’s performance of ‘Trailer Hitch’, which was the first single released from the debut album. A video of this performance can be seen below. I was quite surprised to hear this so early in the show, as I thought this may be the encore, but it got the crowd singing along and certainly set the tone for the remainder of the show. The track has an incredibly catchy chorus – “You can’t take it with you when you go, never seen a hearse with a trailer hitch, never seen a hearse with a trailer hitch”. Everyone in the Brooklyn Bowl seemed to know the lyrics and Kristian seemed blown away by the response of the crowd. Kristian said “music should either make you shake your hips or explode your heart”, and his track certainly ticks one of those boxes! He threw in a bit of ‘This Is How We Do’ by Katy Perry at the end too – who knew that could be turned into country song? Originally, Kristian was scheduled to play for 1 hour but in truth, the show went on for nearly 90 minutes (I don’t think he followed the setlist, much to our delight!). Alongside the Sugarland hits and ‘Southern Gravity’ favourites, we were also treated to a performance of his new Christmas track (YES, CHRISTMAS IN NOVEMBER!) called ‘Thinking About Drinking For Christmas’. Get this one on your Christmas playlists! In true Kristian Bush style, it is such a catchy track which I’m sure will be my Christmas anthem this year. Much of the audience had not heard the track before, but by the second chorus Kristian had everybody singing along. Another highlight for me was hearing ‘Flip Flops’ being performed live, a favourite of mine from his superb debut album. It has such a simple melody but it is so effective, and the chorus will get stuck in your head for ages, trust me! Kristian explained that the lyrics were based on a personal experience of a night out that went too far, shall we say! “I don’t even drink – I was just over-served”….probably the quote of the night. Overall, the C2C Social event was a HUGE success and I think everybody who attended will agree. I am sure, and I sincerely hope, that this will be something C2C will arrange every year, as it was a superb way to build momentum for the main festival and it was a fantastic opportunity for UK artists Hometown Show and Lucy May to perform in front of a large crowd. Kristian seemed to love performing at the Brooklyn Bowl too, and hopefully other US artists will be willing to follow in his footsteps in the future. We had a chat with Kristian before the show, and our interview can be seen below, along with Kristian’s brilliant performance of ‘Trailer Hitch’.